Campervan hire in Manchester. Based in Sale, south of Manchester city centre and only a few minutes from Manchester Airport. When you hire a campervan from New Horizon Campervan Hire our aim is to ensure you have an amazing time exploring the places that make Britain great. 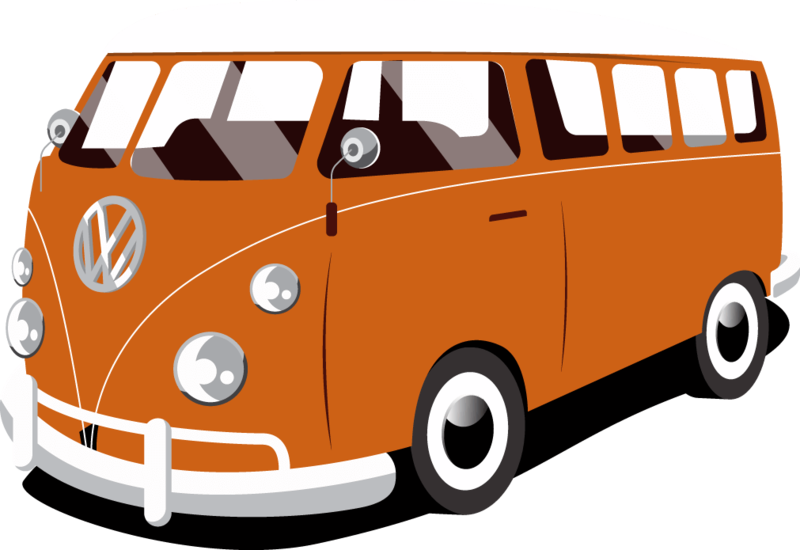 With our iconic VW campervans for hire you can enjoy life on the open road and make your home where you park it. We will do whatever it takes to ensure you get the most from your holiday. We also have a range of additional equipment available to hire to make your road trip that bit more special. If required we can also plan your itinerary for you and organise your campsite bookings (contact us for details). If you want to hire one of our campers to take into Europe we can also accommodate. Our fleet consists of modern and classic VW Campervans, all waiting to take you on your next adventure and help you make wonderful memories that will last a life time. The modern VW Campervan still has the spirit of what the original VWT2 represented and also has a strong following of enthusiasts. These versatile vehicles drive like modern cars and are fitted out with all the comforts you will need on a camping trip. They even have electric heaters so you can go camping all year round. Looking to travel further then these campervans are for you. New Horizon Campervan Hire is based in Sale, Cheshire. Our location is ideal for starting your campervan adventure as we are within a one hour drive of the major conurbations in the northwest of England including Greater Manchester, Lancashire and Merseyside. We are also only five minutes away from Manchester International Airport so if you are flying into the UK for your holiday you can be driving away in one of our campervans within one hour of landing. There are also train and tram stops close by if you are arriving by public transport. Want to leave your car whilst you hire a camper? No problem, just let us know and even better we don’t charge. Our location is not just convenient for collecting your campervan but also a great place to start your adventure. We are close to the motorway network so you can quickly be on your way to your first overnight stay. Within a two hour drive from our base in Sale you can be in some of the very best places the north west of England has to offer. The Peak District, North Wales and The Lake District are just some of the fantastic areas you can visit all within just a short drive. See our page on places to go for more inspiration. The ports at Liverpool and Holyhead are close by too if you are planning a trip to Ireland. We have always had an interest in VW campers and vans and over the years. Some would say it’s a un-healthy interest and has been rather expensive. We’ve owned rather a large selection of them over the years and can often be found attending the many VW shows both with our vans on a trade stand or just spending time chilling with fellow enthusiast. Our love and interest for VW campers and vans started us on the road to setting up New Horizon Camper Van Hire in 2017. Our mission, well to ensure we keep our lovely old T2 campers on the road and sharing their quirkiness with like minded people who want to experience them but not have the hassle of owning one. We’ve added to the fleet a modern T5 Leisure Drive Vivante too which still has the spirit of the original camper but offers just a little bit more comfort and refinement for those of you seeking a longer adventure. We love adventure and travel too and want to make your adventure or holiday as perfect as possible when you hire from us. Our aim is to grow our business and add more VW campers to the fleet so more people can get out and enjoy that precious leisure time touring the country and making wonderful memories along the way. We are nuts about camper vans here at New Horizon Campers and when we discovered a range of lovely camper van printed products we couldn’t resist but to buy some and build a gift shop within our website. Have a browse in our shop, we have great gifts for the camper van enthusiast from picnic blankets, backpacks, lunch bags and reusable bamboo travel cups. Postage and packaging to mainland UK is on us. Enjoy. 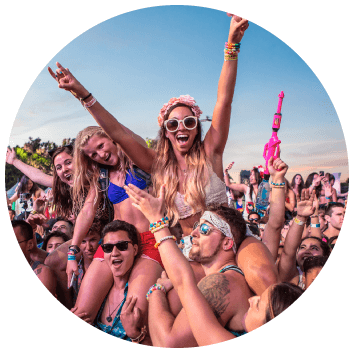 Going to a music festival? Hire one of our Campers for a long weekend for the ultimate in coolness. Better than a leaky tent and oozing serious camper envy. 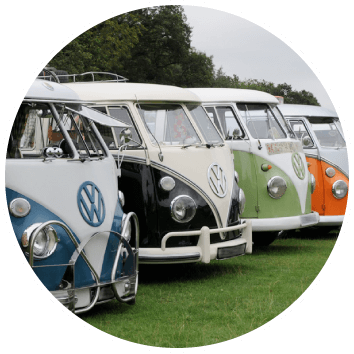 Why not hire one of our VeeDubs and check out one of the many VW festivals that take place throughout the country. This is a truly unique experience and opportunity to take part in the ever growing VW scene in the UK, what better way to experience this than in an iconic VW Type 2 air cooled van. The Camping and Caravanning Club’s Privilege Scheme. New Horizon Camper Van Hire are part of the Camping and Caravanning Club’s Privilege Scheme. This means that you have access to over 110 participating campsites, at discounted rates, throughout the duration of your hire period.